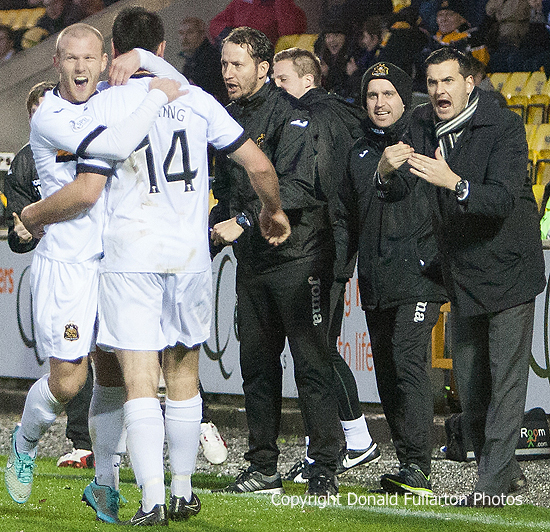 DUMBARTON'S long sequence without a victory came to an end at Livingston in front of a 1,020 crowd. DUMBARTON'S six game sequence without a victory came to an end at Livingston in front of a 1,020 crowd. It was the archetypal 'game of two halves', with the visitors not at the races in the first 45 but taking charge in the second. Sons, with winger Steve McDougall given a starting place for the first time this season, started brightly enough but rarely looked dangerous — failing to trouble keeper Darren Jamieson before the interval. Worse still for the visiting fans, Livingston opened the scoring in the 29th minute when skipper Andy Graham slipped and Daniel Mullen was able to run through and shoot into the corner of the net well out of the reach of keeper Jamie Ewings. If the half-time scores had been the final results, Sons would have slipped to bottom of the Championship standings — but that was not to be. After the break they took up an attacking formation and charged repeatedly at the home defence, and it paid off in the 62nd minute when Garry Fleming got on to the end of a floated corner and slammed the ball home. He ran to manager Ian Murray to celebrate, but the gaffer signalled he wanted more from his players (pictured). He had only eight minutes to wait before Mark Gilhaney passed the ball to Mitch Megginson on the edge of the box. He dragged the ball back, controlled it, then wheeled round and sent a low shot past the keeper. Sons remained in charge until the final whistle, and the result meant that they retained seventh place in the table.